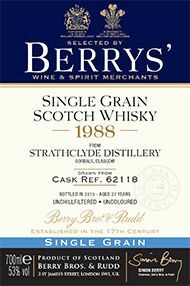 Strathclyde grain distillery is located in the Gorbals district of Glasgow on the south side of the river Clyde. This area is far flung from the picturesque image of remote highland distilleries although it has played a vital part in the heritage of scotch whisky since 1927 and its product is top class. This ex-Bourbon barrel single grain whisky exudes fresh aromas of boiled sweets, apple peel and a trace of eucalyptus. The palate is overtly fruity with a creamy texture rounded by vanilla. A refreshing lemon and lime edge on the finish add invigorating zest. Don’t feel guilty to try this on the rocks. The Kinclaith malt distillery was built within the Strathclyde distillery, which produced primarily for Long John blends, along with Strathclyde’s grain whisky, but also made single malt. In 1975 however it was shut down in favour of expanding the grain distillery buildings. The most famous product of Strathclyde is the Duncan Taylor single grain whisky.